"What this town needs is a Pet Store." No one knows which imp said it, but every imp recognised the idea was pure genius: "A pet shop for dungeon lords? What a great idea, and no one else is doing it! No competition! We'll be rich!" And now you have just opened the first pet shop in town. Right next door to the other first pet shop in town. Across the street from two more. Buy baby monsters! Feed them and watch them grow! Clean their cages! Yes, running a pet store is exciting for an imp, but it can also be mentally challenging: what is the smartest way to win the upcoming exhibition? Which pet is best suited for your dungeon lord customer? How strong a cage do you need, and if you guess wrong, how many family members will be maimed? 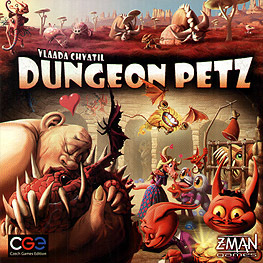 Win or lose, you are sure to enjoy the Grand Opening of Dungeon Petz.